A large, black barrel sits amongst other garbage cans and trash. A fire can be seen burning inside of the barrel. Smoke streams into the dark night sky. Suddenly, a large explosion throws a cloud of smoke high into the air. 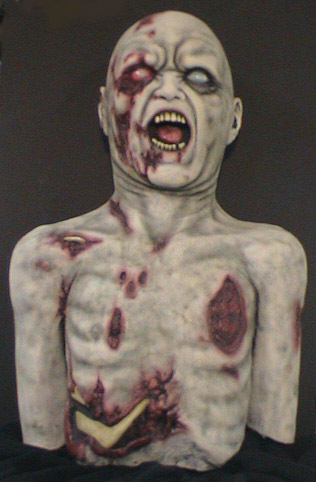 A decomposing body leaps from the barrel with a gut-wrenching scream. He's neither dead nor alive. He's Barrely Alive! 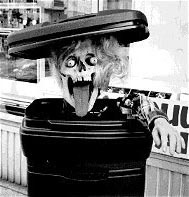 Carl Chetta is generally credited with having invented the TCT (Trash Can Trauma). Larry Lund's Halloween Page has instructions for building Carl's TCT. 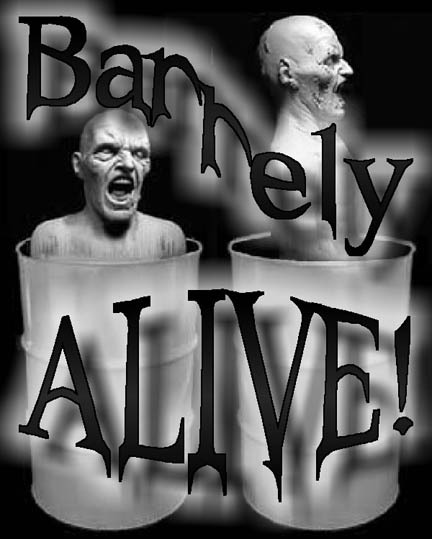 Barrely Alive was inspired by Distortion Unlimited's Barrel Buster. I used Por-A-Kast to create a 3/4" plate in the top of the head. I used soft urethane foam to fill the Back from the Dead prop. I used plaster bandages to create a mother mold of the Back from the Dead prop in order to fill it with foam. I used a 24" cylinder to lift the Back from the Dead prop. Mannesmann-Rexroth Flow Control Valve (1), 540-632-600-1, Motion Industries, Inc.
SSRs are used to switch the solenoid valve and strobe light, air cannon and the fog machine from the stamp. 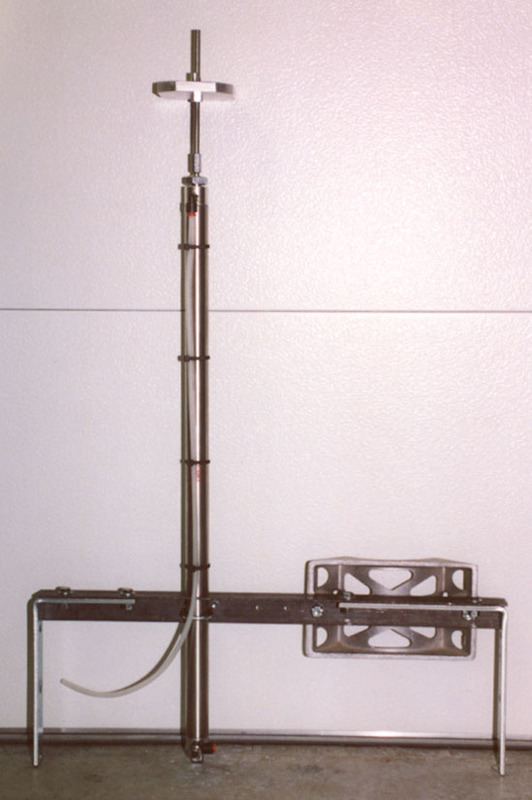 Refer to my Air Cannon page for more information on the Phil Miller air cannon. I cut a shelf matching the outline of the silk flame from a 1/2" sheet of aluminum. I had a hole milled in the shelf to match the orientation and the diameter of the fan intake port. I used small bolts to secure the silk flame to the shelf and angle brackets to secure the shelf to the barrel. 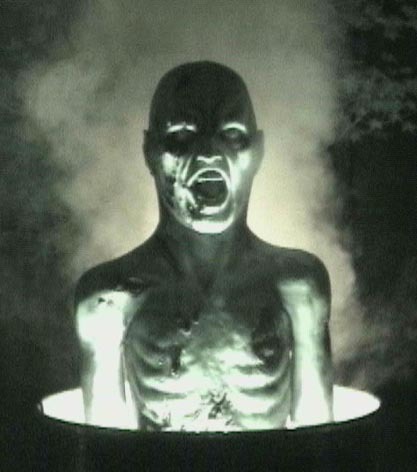 I incorporated an air cannon built from The Haunted "How-To" of Phil Miller, presented by Underground Entertainment magazine. 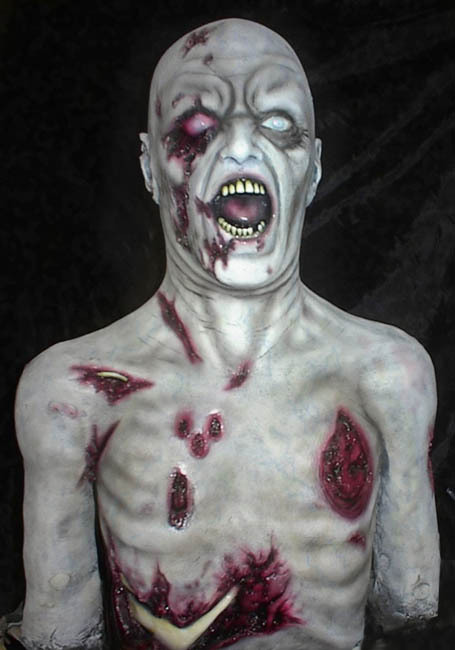 The Back from the Dead prop was filled with BJB TC-265 soft urethane foam. In order to fill a latex prop with foam, you must make a mother mold, otherwise the expanding foam will distort the shape of the prop. 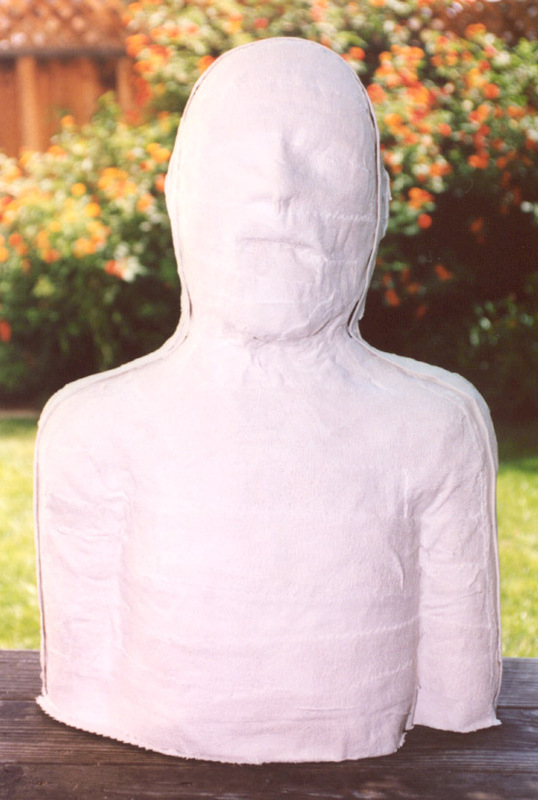 I first covered the prop with Syran wrap and then made a mother mold using Johnson & Johnson plaster bandages. 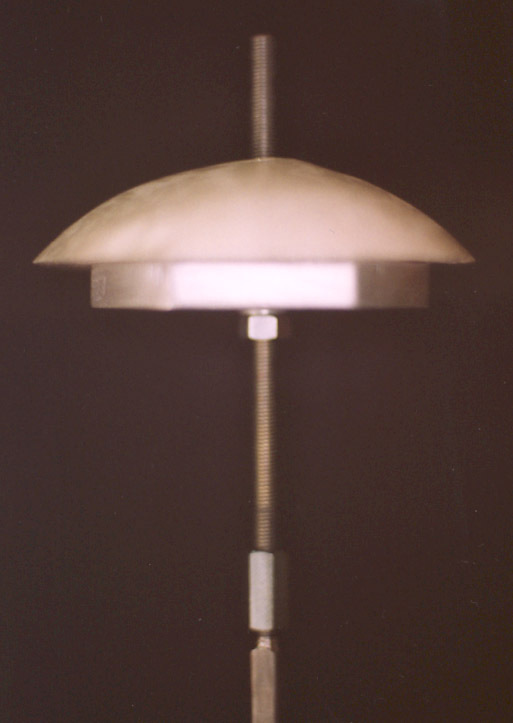 This is a frontal shot of the two-part mother mold. Vaseline served as the release agent between the two halves. 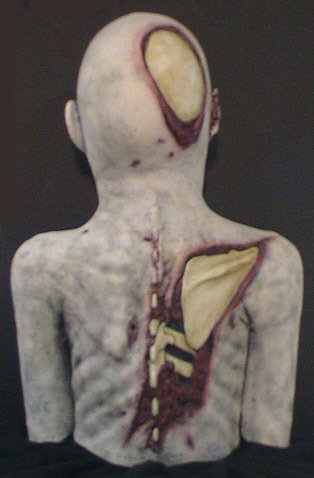 I first poured a plastic plate into the top of the head using Por-A-Kast. The plate serves to more evenly distribute the force of the cylinder. I drilled a hole in the plate through the top of the head corresponding to the center of gravity of the armature. I used a black Sharpie marker to mark the position of the plate and then removed the plate from the mold. I started with a square aluminum plate. 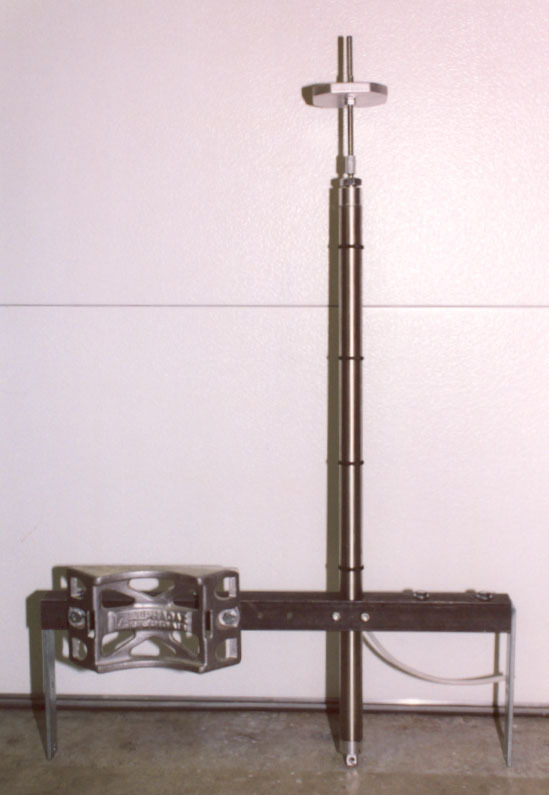 A length of all-thread was used to extend the rod of the cylinder. I drilled and tapped a hole in the center of the plate to accept the all-thread. I drilled and tapped a pair of holes to either side of the center hole to accept sawn-off bolts that would serve to prevent the armature from rotating on the plate. I positioned the plastic plate on the all-thread and marked and drilled holes to accept the sawn-off bolts. The corners of the plate were rounded to allow it to comfortably pass through 4" schedule 40 PVC. 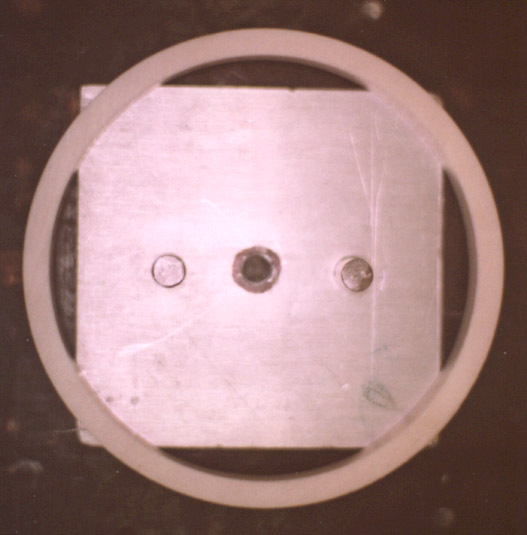 The center photograph shows the finished plate mounted on top of the cylinder. The photograph on the right shows the plastic plate resting on top of the aluminum plate. You can also see the couple that was used to join the cylinder rod and all-thread. I roughed up the smooth surface of the plastic plate using a file. I applied flexible super glue to the plate and repositioned it in the top of the head. I covered the length of 4" PVC with Vaseline. I secured the length of 4" PVC to the plate using oil-based clay. I mixed the two-part soft urethane foam and began to pour it around the PVC pipe. Unfortunately, the PVC pipe didn't release as easily as I had hoped. I ended up working a thin piece of wood that I beveled at the end in between the foam and the PVC until I was able to remove the PVC. In hindsight, I would have used a light form (a cardboard mailing tube for example) that I could have left in place. This is the completed assembly. The whole assembly sits in the bottom of the barrel. 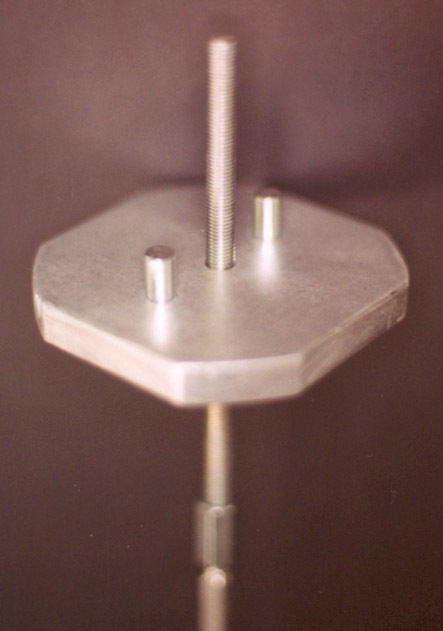 The foot of the cylinder passes through a hole in the bottom of the barrel and is secured using a locknut and washer. 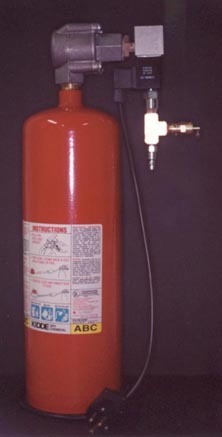 The air cannon was secured to the rectangular aluminum bracket using a large hose clamp.